Desk job or Field job? Income Tax inspector: Good or bad? By the way how to prepare SSC CGL exam? Many aspirants have doubts regarding what to fill up in “Preference order” for the SSC-CGL job application? So, following information should help you get some idea. Please note: I’ve not written this article all by myself. Most of this stuff is copypasted from the inputs given by some serving officers and pagalguy members, including csl180, prince1 and others. If you want to add update /correction / elaboration regarding these jobs, please do post your inputs in comments at the bottom of this article. Assistants, Auditors, Accountants, Tax-assistants, upper division clerks. 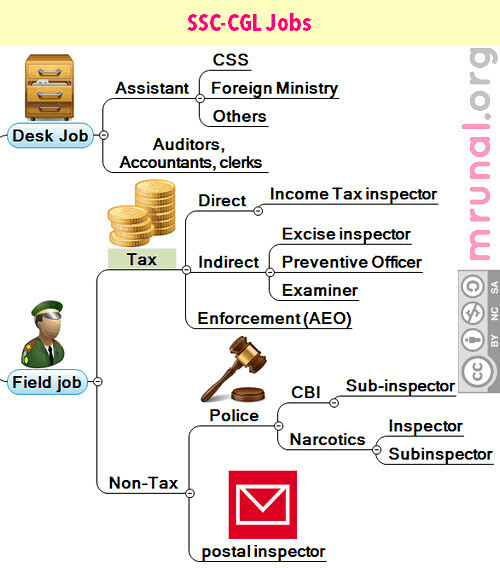 Inspectors (income tax, excise, preventive officers, examiners), CBI, narcotics etc. In some of these jobs: Physical standards required. (given on page 20 of notification) click me to see SSC CGL 2013-notification. The working hours of desk job are “fixed”. (in most cases, except Assistant (cypher). It’s like office to home, home to office. So if your ultimate aim is preparing for some other exam (UPSC/CAT etc) then these are the “right” jobs because of the “City –posting” (Delhi or some State HQ). Field jobs involve travelling, carrying out raids, inspections, surveillance etc. Sometimes you might need to work in non-office hours or even Sundays. Less than field job (at the initial level). Social status, nuisance power of field job is higher compared of desk job. I mean, in terms of impressing your parents, siblings, friends, college-batchmates, relatives in your village and girlfriend and her parents. comfortable for family and social life. (some of these) Jobs involve stress, dealing with informants, power-brokers, pressure-tactics, backstabbing bastards (within your department). Almost all of these jobs involve transfer from one city to another. Therefore family/social life=little bit of trouble. Some adventure (raids etc) although nothing very “dangerous”. (For Dangerous stuff you’ve to apply for CDS or CAPF). So first decide-what do you want: Desk job or Field job? Second Question: do you want to permanently shift to Delhi or not? Because If you don’t want to shift to Delhi, then job of Assistant in CSS and various Central Ministries=useless for you. Similarly, if you don’t want to leave India, then MEA assistant =useless. Now, we’ll see the Desk jobs, and in the later part of the article, we’ll see the Field jobs. Section Officer (Group B Gazetted). To become SO, you have to pass departmental test, conducted by UPSC. If you don’t pass exam, you get promotion very late (after 10-12 years). Work=files, files and files and then more files. It is like you’re given the project, and you made the dealing hand. Now report the problem in short about the project and tell your recommendations on what can be done. If your seniors like they will accept it or else they will tell their own decisions etc=this is CSS work. In other places like MEA or railways you’ll have 5 ,10 etc.so promotions are faster in CSS. If you become Assistant in say Railways, then you’re stuck in Railways forever. But CSS offers you wider variety of postings like in Ministry of consumer affairs, home, finance, education, civil aviation, law etc. Therefore, your scope and work-diversity is huge. (just like an IAS officer). 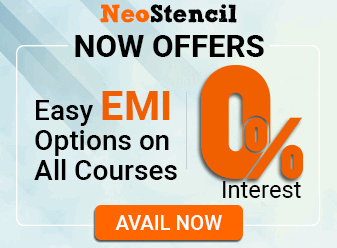 Good for preparing UPSC (because you’re in Delhi, the Mecca of UPSC preparation) Less. Low You can earn more (via bribes), provided that you know your job, duties well, otherwise people (your own colleges and bosses) will stab you in the back and you’ll be suspended hahaha. Permanent posting in Delhi until you retire. Transfers, deputation, field posting. Once you get promoted to Under Secretary, you get free air-tickets during travel. Not applicable. But you get free petrol, free mobile card etc in some jobs. So it should be clear to you that in Desk job: first preference = CSS (Job application code “A”). It is one of the most sought Assistant post under SSC-CGL. Why? Because charm of foreign posting and many other lucrative facilities like children’s education, accommodation etc and a very handsome salary of more than 1 lakh per month (perhaps upto Rs 1,25,000). But here is the problem: in the foreign countries, the cost of living, is also high! For example $1500 is big amount when converted in Indian Rupees, but inside America, you can buy very few things. And one can be posted in countries like Afghanistan, Pakistan, Irak, Libya too. but nothing to fear on this count as while sending one to an other country on posting he is given a few choices for the needed postings and he is posted according to those choices preferably. If one chooses any of the countries mentioned he is given 50% more salary and his tenure there is counted as DOUBLE; means he has to serve there for one and a half year which is counted equal to three years. They have to do the task of coding and decoding in addition of some highly confidential language. promotional avenues are better in General Asst. You can go upto level of Under Secretary. And it’s like u have to work for 6 days and then 2 days off. And 2 days will be night shift. One can get his first promotion after about 15-17 years if he will not clear departmental examination and after clearing departmental examination, it will take around 8 odd years. Verdict: if you originally wanted to be an IFS officer, but it did not work out, then perhaps this is the job you should try for. all this for tier 2 AC ticket..then railway has its own railway homes all over India ..so you can stay there at a very cheap rate, if you using railway passes! Always in Railways. Posting in variety of department and ministries= life is not monotonous. Posting in various cities/regional HQ for example Lucknow. Always in Delhi till he retires. I Other Ministries/ Departments/Organisations but gradepay is 4200. Please note: these may or may not involve Permanent Delhi posting. For example,Other organization >>Election Commission =always in Delhi. But other organization >>Coast guard=sometimes in Chennai (Eastern command) and sometimes Kolkata (North Eastern Command). To sumup, if you want “assistant” job, select A to I job codes first. But Internal choice (A,E,F… or E,F,A.. or whatever) that is as per your career-interest. Posting: Once you join as Divisional Accountant in a state, there is no chance of moving outside the state. They’ve have direct engagements with contractors, so they earn (bribes). Divisional Accountant works in Public works departments offices (PWDs) which is a state govt office. Though his payroll comes from State govt, he is always a central govt employee. Since he is Central govt representative in state dept he enjoys great power and respect in the office and works independently, doesn’t need to report to anyone but himself. In terms of pure salary: Divisional accountant is better than Auditors, jr.accountants. Pay Band -I: f 5200-20200, Grade Pay 2800. CGA Controller General of Accounts. deals with audit works of defence forces (in various offices around India). Although salary of DA is less than Income Tax inspector. in the respective category are utilized. The rest of the candidates in that category have been assigned the department with left over vacancies. The same criteria have been used to allocate department of C&AG and CGA to the candidates selected for Jr. Accountants/Accountants. Auditor is the best amongst all non-interview post. I have been working as a Senior auditor in dad dept.(min. of defence) since 5 years. in CGDA you will be appointed as an auditor in defence acctts. Initially u will get army/navy/airforce/ordnance factory command. You have to do the manual work like passing of bills,auditing pay bills of Staffs, accounting the factory production in factory command. You will get ample time to spent with your family. You will get automatically promoted to Senior Auditor (grade pay 4200) in 3 years . You will get a chance to sit for deptmental SAS exam for the ppst of AAO (Gazette post) after completion of 2 years. Promotion wise its a good dept. over all i have enjoyed thoroughly as an Auditor. so i will recommend each and every one(those who got selected in non interview post category) to give auditor as his first preference. Ok so far we saw Desk Jobs>>Assistant, Auditors, Accountants. Promotion : after promotion you rise to inspector level, and then to officer level. So joining as TA, you begin at one step lower. Promotion wise, CBDT (direct tax) is far better than CBEC. Both of these are transferable jobs. when you become a senior, you are automatically transferred to your home town for convenience. (Mostly) Delhi posting. He gets transferred from one ministry to another. Ok this concludes discussion on “Desk Jobs”. Now moving to Field jobs: Inspectors in Income Tax, Excise, CBI, Narcotics etc. Non tax means: CBI, narcotics and postal Department. Levied on your income and property. Income tax, corporate tax, capital gains tax are examples of Direct tax. Central Board of Direct Taxes (CBDT) deals with it. Levied on goods and services. Service tax, custom-excise are examples of Indirect tax. Central Board of Excise duty (CBEC) deals with it. Note: Sales tax is also an indirect tax, but State Governments look after it. You’ve to pass departmental exam to get promotion but it is for “screening”, otherwise promotion is actually given based on your zonal seniority. In Income Tax and Excise, initial years= you get posting only in the given zone. But once you get the “group-A” promotion that is Assistant Commissioner= you can be posted all india. Because those Group A jobs are just same like direct recruitment via UPSC civil service exam. According to All India Association of Central Excise Officers, the people joining in Income tax (CBDT) and Examiner (CBEC) get more promotions (6-7!) 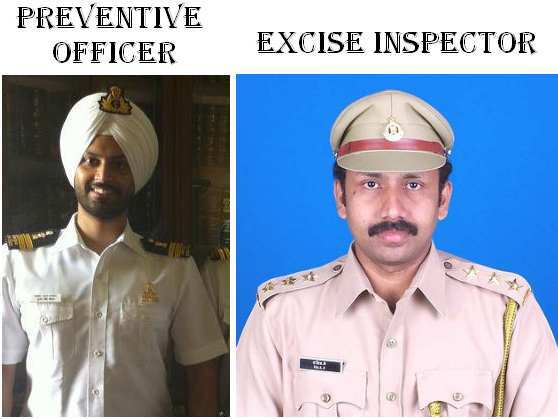 while Excise inspectors get barely 1-2 promotions, despite joining in the same year. Qualification for an ITI to get promoted to ITO is 3 years, though seniority also plays a major role in promotions. So basically it takes atleast 4-6 years to get promoted to ITO(considering the fact that one clears departmental exam in time), depending on the zone. (input by Rahul, CGL 2010). He has and refund of it in case someone has deposited in excess. He also has to see the work related to TAX DEDUCTION AT SOURCE (TDS) besides being accompanying a raid team. An Income tax Inspector on non-assessment seat generally has to do do clerical work though he too could be asked to accompany a raid team. He is part of the raiding party. He is entitled for 30 liter of petrol if posted on assessment seat. He also gets a SIM from the department on which all STD calls on every type of BSNL/MTNL phone are free; and 400 minutes on other phones whether STD or LOCAL are free for every month. This SIM is provided to every ITI irrespective of the seat he is posted at. vulnerable post involving risks of making enemies..
Post is under strict vigilance by CVC. departmental complains from colleagues and public can get you in trouble very easily. too much hardwork & treachery to remain in importance. Now let’s talk about the inspectors associated with indirect taxes viz. excise inspector, prevention officer and examiner. Following are the requirements for Central Excise/Examiner/Preventive Officer/Inspector & Sub-Inspector In Central Bureau of Narcotics. In case of Garwalis, Assamese, Gorkhas and ST candidates. Height relaxable by 5 cms. Height relaxable by 2.5 cms.Weight by 2 Kgs. You have certain number of factory units or business entities under you. Your job is to scrutinize records to verify that the correct amount of the tax has been paid (according to production of particular goods). have some control over the production, money making capacity of community industrialist, business men, etc. your area of working is defined. for those wanting an adventurous jobs, area of work is very broadly defined. in special cases you can also go out of your area also to nab a culprit, which gives u some more power than CE excise, ServiceTax or an Income Tax Inspector. Its a kind of job of both collecting intelligence as well as prevention- be prepared to work day and night, far away from your home. sometimes they conduct raids etc but not so adventurous or risky. It Is more about intelligence gathering and raids. Checking boats, cargos, containers coming from foreign ports. auction and disposal of confiscated goods. a preventive officer also acts as a facilitator of trade and commerce and tourism. examine the goods imported or to be exported and assessing duty on that. These are all “Tax” officers. (direct or indirect). There is one more officer associated with taxation: Assistant Enforcement officer (AEO). But he doesn’t fall under CBDT or CBEC. He is under Directorate of Enforcement, Department of Revenue. If posted in the field, he carries out regular inspector type of work, viz. to arrest and prosecute the person suspected to be involved in the act of money laundering, etc. Now let’s talk about non-tax inspectors. No physical test (like running, cycling carried out, unlike those indirect tax inspector jobs). Life in CBI is stressful due to heavy workload and deadlines there. Training duration is 32 weeks involving physical training and training on criminal and anti-corruption laws. During the training the daily physical activity includes 2 km run, PT, Drill in the morning and Games/Unarmed Combat Course in the evening. It is not a 24 x 7 job; but sometimes the work streches beyond the usual working hours i.e. sometimes one has to work till 8 or 9 pm. Usually on Saturdays, if the workload is more, the work goes on as usual; though Sundays are spared. Also in some branches like Special Crime etc, the job involves a fair bit of travelling especially in the starting years. The nature and hours of work also differs from branch to branch and place to place. Some branches have less workload and so the personnel can take it easy. Sub Inspectors in CBI or for that matter any rank in CBI does not possess revolver/pistol. In a very few cases, when a search is to be carried out in some dangerous places, weapons are issued to the staff. # Subinspector Pay Band -I: f 5200-20200, GP=2400. Mrunal edit: still searching for job profile, posting, promotion etc. if you’ve information, kindly post it in comments. Well this doesn’t really count as “field job” because Field job=social status and nuisance power- unfortunately postal inspector gets neither. Update: input from Mr.Abhi D.
Inspector of Posts (IP) is either posted as Subdivisonal Inspector or IP-PG(Public Grievance). He/she is incahrge of about 60-70 post offices within his/her subdivison. He/she is appointing authority for GDS (Gramin Dak sevaks and conducts their interview). He/she is assisted in his work by two Mail overseers.He/she gets seperate office and montly allowance for internet and telephone (Rs 750) . He/she is provided with a laptop and he gets his travelling expenses reimbursed by submitting TA(about Rs 2000 for 10 days on tour ). Inspector of posts is there with every postal division. There must be 2 or more divisions in district. Presently the Postal inspector must go to canvass people for getting Postal Life Insurance and also they have to acquire a huge sum for the department. The Department of Posts has given instructions to all circles to enhance their growth by 20 percent- All such burden comes on Postal inspector. that was very helpful, thank you ! I’m Assistant with 9300-34800 & G.P. Of 4200 in Secretariat , Daman, UT of Daman and Diu (Exam was conducted by secretariat for local personnel). If you find a way please suggest me. Sir, The one who wants to be in Delhi to prepare for UPSC or CAT, what will be the preference of choices ??? Sir, I want to know about the Jr. Statistical Investigator post,,, so sir plz give the details about that post and what are the qualifications??? dat dishrtd me .how can u be a part of such mindset. I have scars on my arm. will i be rejected in medical or physical for inspector post in income tax, exceise or custom? i got selected for auditor CGDA. which one is better for auditor office work or field work? if office work, then which office should i choose near Gwalior (MP)? does income tax inspector require all physical requirements? Sir, will CET replace SSC CGL TIER 1 in 2019? If so, will there be any change in the pattern and syllabus?